Wouldn’t it be nice to live somewhere hot where the sun was shining all year round? Have you ever noticed that during the warmer months and while you are on holiday somewhere hot you tend to find that any aches or pains that you are living with seem to go away and generally you feel less stiff? I know what you’re thinking, it’s probably due to the liquid anesthetic that tends to accompany a trip away (prescription G&T). … OR, could there be a more scientific reason behind this temporary window of relief? A lot of my patients over this past month have been getting more and more concerned about the colder weather and how it can affect their joints (especially their knees). One patient said that her knees were better at forecasting the weather than any weatherman/woman! … There is definitely some science behind why aches and pains can go into the background when you are in a warmer climate. In this article Ed is going to give you some easy actionable tips to help leverage the science of why things feel better on holiday in warmer weather, so that you can enjoy keeping active in the colder months too. Move, exercise and stretch (especially in the morning! )It’s pretty safe to say that when you’re on a nice warm summer holiday, you tend to move around more.Whether it is a long stroll along the beach or going for a swim in the pool. This is fabulously good for your joints (especially your knees!). Think of moving and exercising as a way of lubricating your joints. The more you move the better your joint will function and the better you will feel. Because after spending 8 hours in a stationary position, your joints collect fluid and become slightly swollen (which is also why you are taller in the morning). So, doing some gentle yoga styled exercise during the first 30 minutes of when you wake up will help to flush away this excess fluid and set you up for the day. Be sure to take on lots of water when your first wake up as well because your body loses a lot of water overnight and dehydration can cause you to feel stiff too. Glorious sunshine… The vitamin D we get from the sun is part of why your joints can feel freer during warmer weather. Wouldn’t it be great if you could bottle it up or make into a pill? A recent breakthrough study from a team at University College London looked at the use of vitamin D to combat conditions like rheumatoid arthritis and osteoarthritis and the results were very encouraging. Their research showed that taking vitamin D supplements helped to suppress the inflammatory component of these conditions (the painful bit). This could be a very big part of why you feel more supple, less stiff and generally less achy during the warmer months. Taking vitamin D during autumn and winter will help counteract the lack of sunlight. The NHS recommend taking 10mcg per day. Always speak to your physician about taking Vitamin D supplements before starting to take it. Avoid high fat or sugary foodsEverything in moderation, right?True, but when eaten to excess these types of foods can wreak havoc with the body’s biochemistry. High fat and sugary foods when consumed in high quantities can cause the body to become more sensitive and reactive. 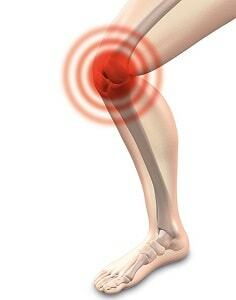 What does this mean for your knee joint? Your “inflammatory response” can be more easily triggered meaning that the joints around the body can “flare up” without warning leading them feel stiff and painful. In other words: cheeseboards should come with a health warning! Use heatWarmer temperatures during the summer months play a big part in why your joints can feel freer.This is because you have better blood flow to your knee joint. You can either keep your knees warm with some knee warmers or just put a wheat bag in the microwave and let it rest on your knee before or after you have been out in the cold. And no, Deepheat does not count as heat. Use MassageWhen you’re on holiday, a massage is a great way of relaxing because of the therapeutic effects it provides.Massaging around your knees will help too. Get some olive oil out of the cupboard, rub it between your hands so the oil is nice and warm and get massaging. Super simple, immensely effective, and doesn’t involve having to take medication. Go one step further and use an essential oil which provides you with some aromatherapy whilst you’re at it. Nothing too complicated here, very similar to applying heat, the knee will warm up, blood flow will increase and your knee will start to feel youthful once more. (Be sure to check the label if you have any allergies to certain oils). So, there you have it, some helpful tips for keeping your knee joints supple this winter. Don’t let the cold weather ruin your ability to be active. You just need to add a few things into your daily routine and plan each day a little.